Mark Robins made the first managerial casualty of 2014/2015. Huddersfield Town have this morning parted company with manager Mark Robins after 16 months in charge at The John Smith’s Stadium and one one game into the new Football League season. Robins, who left Coventry City after just six months at The Ricoh Arena to join Huddersfield was at the helm of The Terriers for 16 months, but lost their 2014/2015 season opener 4-0 at home to Bournemouth yesterday thanks to two goals from former City striker Callum Wilson in his Cherries debut. Whilst still in the City hot-seat Robins was first linked with the vacant Doncaster Rovers position and various other clubs but nothing really came of this interest and he told the Sky Sports cameras before the JPT Semi-Final game against Preston North End that ‘it’s (Coventry City) in my blood’. 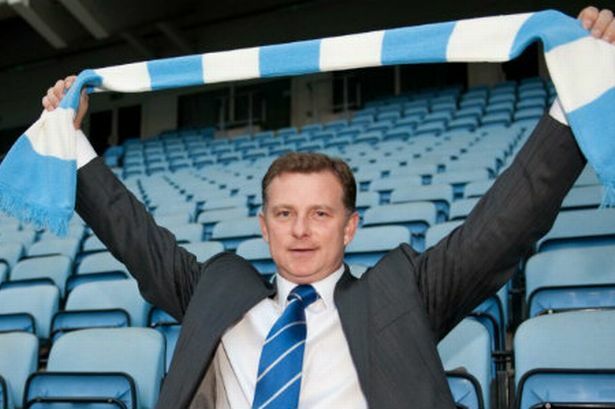 However, on 12 February, Coventry City released a statement saying they had allowed Mark Robins to go into talks with Huddersfield Town about their vacant managerial position, destroying Robins’ relationship with the City fans. Just two days later he was unveiled as Huddersfield’s new manager. Robins took charge of 33 games whilst with The Sky Blues, winning 17, drawing 6 and losing 10 – a win percentage of 51%. At the John Smith’s Stadium this dropped significantly taking charge of 68 games, winning just 23, drawing 14 and losing 31, leaving with a win percentage of just 34%. A statement on Huddersfield’s club website read: “Following yesterday’s first day defeat, Mark met with the board of directors. At the conclusion of the meeting, Mark and the directors all agreed it would be in the interests of all parties to part company. Accordingly, Mark’s contract has ended amicably and by mutual consent. Huddersfield chairman Dean Hoyle praised Robins for his hard work during his time at the club. “Mark has put his all into the job over the past 16 months and has made a big contribution to the club,” Hoyle said. “He arrived at the club at a difficult time and immediately impacted to keep us in the Championship. “Mark’s approach to this has been refreshing. He has always put the club before himself and worked tirelessly on the training ground to change our way of playing and we have seen that come to fruition. EDIT: As of 17:00GMT Sunday, 10th August 2014, current Coventry City manager Steven Pressley is the 2/1 joint-favourite (with Billy Davies) to replace Robins at The John Smith’s Stadium with Football League sponsor SkyBet. « Seaborne leaves Coventry by mutual consent. Hmm, does seem strange? They must have someone in place, I don’t get why they didn’t get rid before pre-season though?